So, it's been a while since I last had the urge to write a review of a series I've seen. Well just recently I've finished watching a series that has captured my heart. 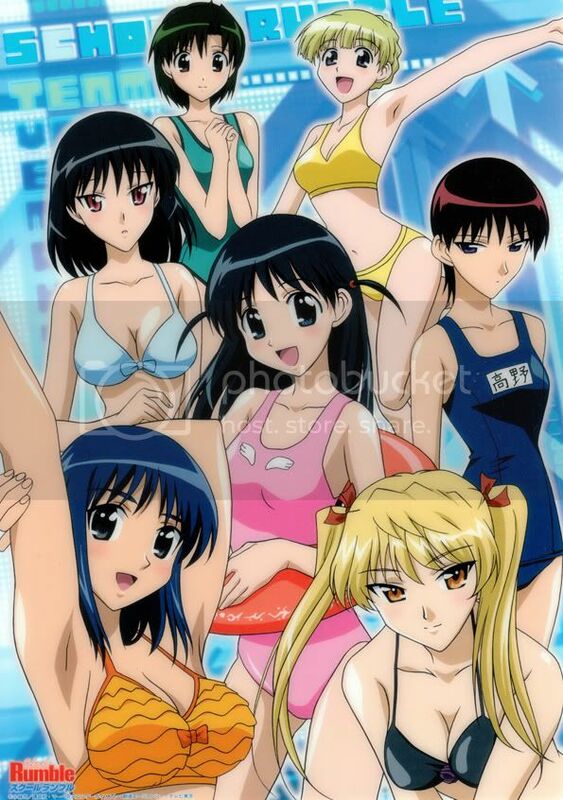 This series is School Rumble Season 1. After watching the first 5 minutes I instantly knew “Yes, this is what I've been waiting for”. After those first 5 minutes the next 3 days were devoted to blasting through all 26 episodes of season 1. What an enjoyable journey it has been. Humour and romance with the occasional sprinkle of seriousness, and a large cast makes this an enjoyable series to get in to and follow. 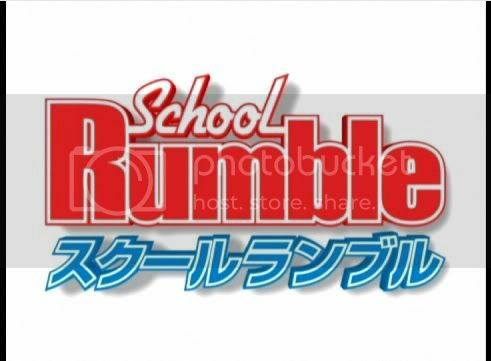 But wait you say, what is School Rumble about? Well basically it's following two students through Year 2 of High School. You don't just get to follow those two though, there are small side stories and adventures to be had with the numerous other characters. 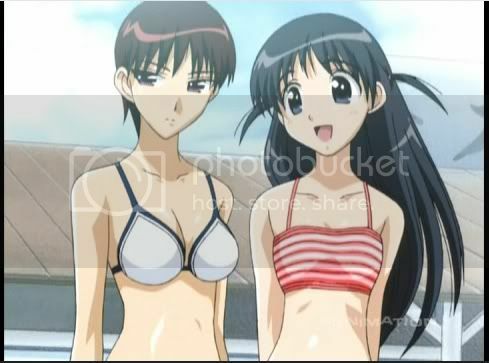 The main focus however is on Tenma Tsukamoto, a female character trying to tell a boy, Oji Karasuma, she loves him. 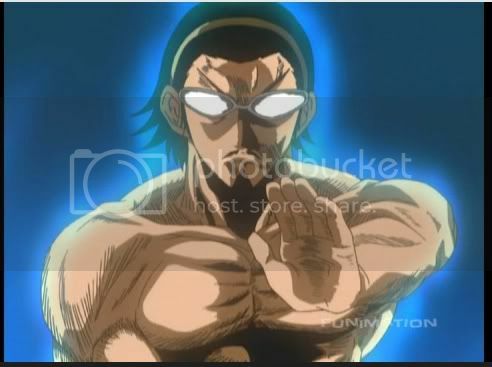 Then on the flip side there's Kenji Harima, a male character who is trying to tell Tenma how he feels about her. What have these two characters got is common then? Well first off they're both very naïve and a bit “slow”. This leads them in to many awkward, yet humours situations. Then there's the fact that they can't tell the people they love their true feelings. 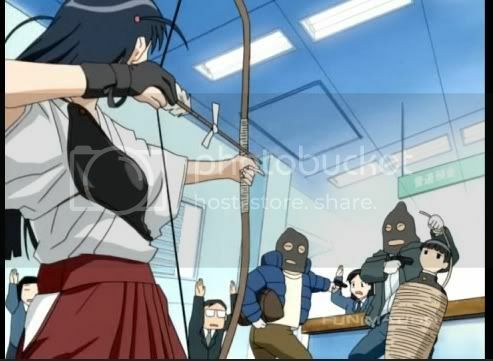 This also winds them up in sticky situations that end up involving the rest of the cast somehow. I won't ruin any of these encounters for you, since most of them are continued throughout the series in some way. Each episode is normally broken up into three “sketches” and each one usually leads in to the next one. 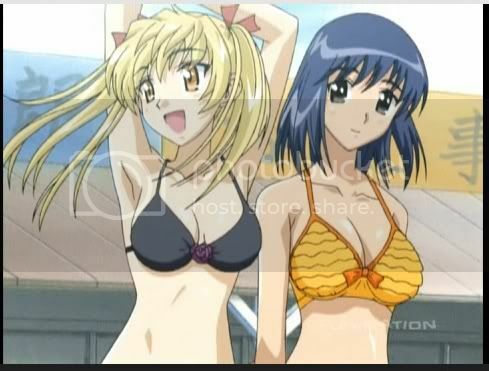 You've also got all your usual scenes, such as “cleaning the pool”, “going to the beach”, “going on a class trip”; but you also get some unusual ones. What really made this series so enjoyable for me though was the combination of great artwork, character personalities/traits, and the recurrence of past events all linking together. This all builds to make a very enjoyable series that does not get dull or dry throughout all 26 episodes. Then for the male characters you've got many different styles such as “tough guys” and “geek guys” all mixing in together. This mix up of styles is great because it means you can select certain characters that you like and follow them through the series. This also links in with the personalities, because again you can select your favourite character and follow them through. There's something for everyone, from your “rich girl” to your “athletic guy”. This also adds a sort of realism where no two characters are the same, just like you would find in a real school scenario. Even the most minor characters are unique in some way and help add to the likeability of the show. Then finally, all the crazy side stories and misunderstanding in the series come together to progress a relationship or hinder it. Where something works at bringing two characters closer together it might also set two others further apart. Then something else will happen which will change the class dynamics again. For me being able to see how your favourite character is affected by the actions of another is interesting and never becomes boring in this series. Sometimes your character will get no screen time in an episode, then in others they are the centre of attention. 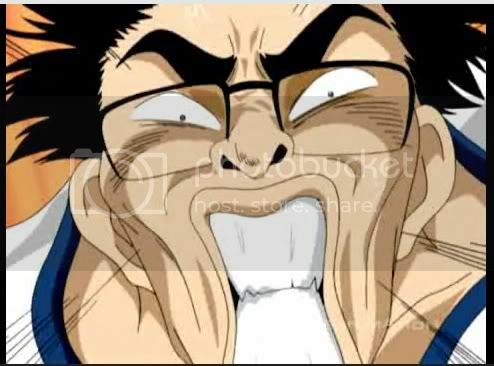 I watched the English dubbed version on the Funimation website. I must admit that all the voice acting was superb, and the voices really suited the characters they were assigned to. There were no awkward moments either which usually crop up in crying scenes or shouting scenes. I found the voice actors handled these very well which made them a pleasure to watch/listen to. 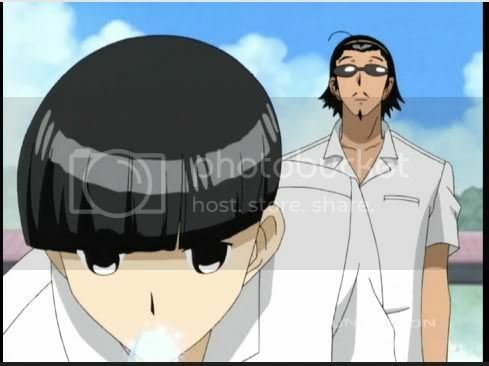 So to summarise, School Rumble was a very enjoyable series for me. The combination of character artwork and personalities, and then following through their adventures was an enjoyable experience. I would recommend watching this series to anyone, it's really that good. I can see however people who have “seen this type of thing before” or get tired of going in circles would find this series less enjoyable. I will be diving in to the OVAs and season 2 shortly on the Funimation website. I believe season 1 had started getting released here in the UK on DVD, but it's been put on hold until 2009. I think they got up to volume 3. There's also R1 DVDs available of the series if you want to import them. And of course you can watch it for free just now on the Funimation website. Just going to put my marker here. I'm going to watch this soon, so I want to see it fresh.